A simple idea that sees employees ride to work quickly and without much exertion has seen Thijs van der Heijden and Kent Kavanagh develop a ground-breaking business. E-stralian leases hi-tech pedal-assisted bicycles (“e-bikes”) so employees can commute cheaply, cleanly and without having to shower afterwards. The cost is partly offset by a salary sacrifice program. E-bikes flatten hills and beat the headwind so riders arrive refreshed and sweat-free. E-stralian uses major European brands with the latest technology from major drive unit manufacturers like Bosch and Shimano. Once an employer has signed on to the salary sacrifice option, users calculate their lease rate online. Instead of paying at least $3000 for a new bike, the lease covers rent, servicing, maintenance, emergency repairs and damage/theft insurance in one regular fee. Thijs and Kent are both passionate about active and sustainable transport. Thijs is a financial economist at the University of Melbourne and Kent has more than 15 years’ experience in asset finance and corporate finance. Thijs has advocated cycling since moving to Melbourne from the Netherlands in 2011. 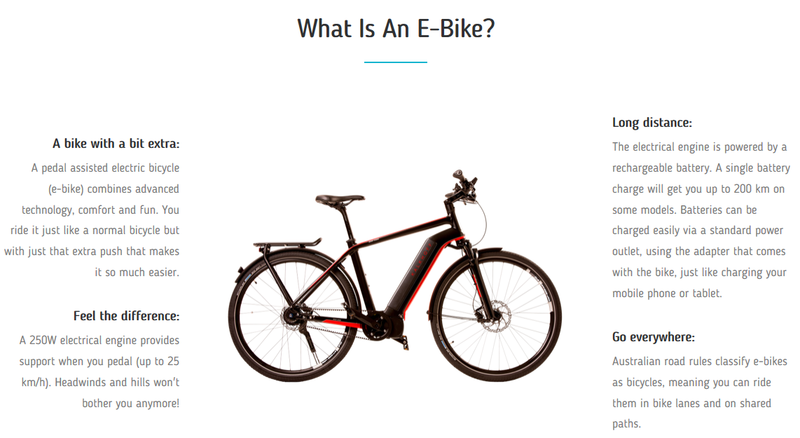 “Seeing how e-bikes have taken off in Europe and noticing the potential for them in Australia, we set out to make e-bikes more widely known and accessible,” he and Kent say. At the moment, the business works with local governments, corporations and small businesses in Victoria, New South Wales and Western Australia. “We combine a passion and knowledge about bikes with experience in finance,” Kent says. “Thijs is a certified bike skills trainer with Cycling Australia, and bicycle mechanic. Thijs and Kent learned about SBMS through the City of Melbourne Small Business Grants Program. They were successful recipients in 2016. Mentoring is required as part of the grant process, and Thijs and Kent liked the idea of having a fresh pair of eyes examine their ideas and test their hypothesis. E-stralian is their first business venture. Thijs and Kent were matched with mentor Bruce Abbott, who has more than 30 years’ experience in the steel, manufacturing and distribution industries. After starting as a metallurgist with Comsteel, Bruce became marketing manager and moved to BHP, where he rose to Group Manager Marketing before spending 15 years in executive recruitment with Boyden Melbourne. They decided to review progress in four months, including what worked and what didn’t, the most productive business leads and the effect of traffic congestion caused by underground city rail works. Bruce says Thijs and Kent had a well-thought out concept using an innovative novated lease. “Being a new concept, it requires a ‘missionary marketing’ approach at several levels,” he says. Since seeing Bruce, E-stralian’s profitability has increased and Bruce is hopeful this will continue as Kent and Thijs refine their marketing and sales strategies. They have also added three client organisations, hired a part-time staff member and had a more consistent stream of enquiries. Thijs and Kent say the mentoring helped them streamline their marketing and focus on more promising clients. “The guidance of our mentor Bruce has allowed us to focus more and therefore take on more workload to expand and grow the business,” they say.